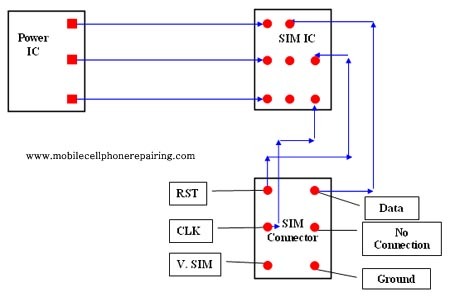 This chapter explains Mobile Phone SIM Problem and Solution – Mobile Phone SIM not working and How to Display Fault in any Mobile Cell Phone. These problem and solution apply to all brands and make of mobile phones including Nokia, Samsung, iPhone, China Mobile Phones, Motorola, HTC, Sony, Blackberry, Alcatel, Apple, AudioVox, Benefone, Danger, FIC, Hagenuk, Palm, Kyocera, LG, Panasonic, Huawei, ZTE, Spice, Lava, Sony Ericsson, Micromax etc. What is SIM in a Mobile Cell Phone? SIM stands for Subscriber Identification Module. In a mobile cell phone it is an electronic component or part that helps identification of the User. Check settings and see if the mobile phone is in Flight Mode or Not. If it is in “Flight Mode” then change the Mode to Normal. Clean SIM Card Tips and SIM Connector. If the problem is not solved then change the SIM Card and Check. If the problem still persists then Change the SIM Connector. If you still do not find solution to the problem then Check Track of the SIM Section. Refer to the Diagram of the Particular Model of the Mobile Phone. Books with Diagrams of Tracks are available in the Market and on the Internet. If the problem is still not solved then Heat or Change the SIM IC. Finally, Heat, Reball or Change the Power IC. Check if the IMEI Number of the Mobile Phone is Good or Corrupt. To check the IMEI Number, Dial *#06#. If the IMEI Number is something like – 35826********220 OR *************??? OR ************000? OR ***************? Then the IMEI Number is Corrupt. Reload the IMEI Number to solve the SIM Problem. Check BSI Point of the Battery. The Middle Pin is the BSI. Change the Battery and Check. If the Display shows “Not Charging” and at the same time there is SIM Card Problem then it is caused because of BSI Problem of the Battery or the BSI Track of the PCB. If you need to change the SIM IC and SIM IC is not available then you can do jumper. The function of the SIM IC is just to complete the circuit. Could be SIM Problem or Software Problem. Insert another SIM and Check. If the same problem is still there then FLASH the Software. My Nokia1202 Enter Into Cooking Oil On A Moment Key Pad &sim Card Stop Lead What Can I Do? Clean the whole Phone and PCB with IPA or Alcohol or Petrol and allow to dry. Restart and Check. Assalam o alaikum.ihave a samsung s 2 phone but in samsung google playstore is not working and apps or any thing is not downloaded from the google.ithink id with missing url is on the playstore page. The Best Option is to RESET the Phon and Try. If it still does not works then Reload the Software by some good Technician. Ok. I will create a video and post on YouTube. Sir my phone is lenovo a6000. My phone full dead ,I am check this phone in power supply after ammeter approximately 80 millli amphere current taking ,power supply stuck 80 only,what problem in phone? Did you check the Battery? Is it OK? Check the Power Button.